Reading workpiece position coordinates and postures for robot control. Flexible searches support many different types of workpieces. Previously, bushing parts were arranged by hand or by using part feeders. The part feeders were large and inefficient since the equipment couldn't support multiple part types. 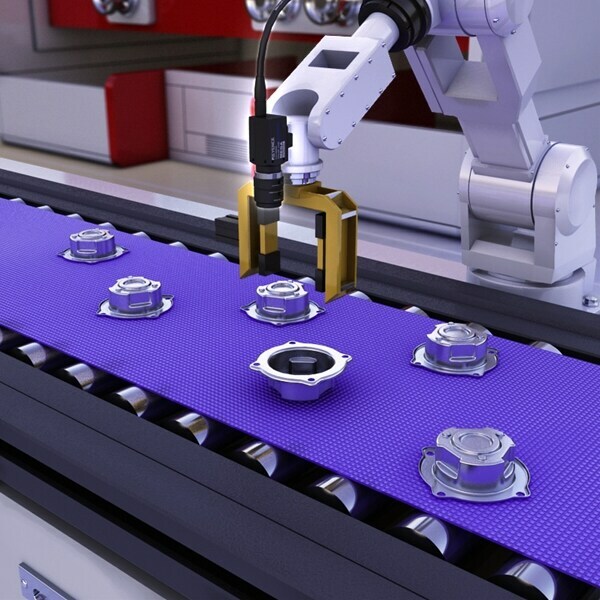 Using machine vision equipment enables instant support for multiple part types and greatly reduces the size of equipment. Offering a lineup of up to 21 megapixel area cameras and 8K line scan cameras, the XG Series contains powerful vision system technology providing flexibility and power to solve a wide range of applications. The XG Series offers programming directly with the controller or advanced programming using the optional Vision Editor development software. High Performance, Icon-driven system with easy-to-use tools for simple setup by any user. The CV-5000 Series has the largest number of camera types for its class, letting you select the optimum camera for a wide range of applications. Providing the ultimate flexibility with a wide variety of camera choices using the industry's highest-performance image processing engine.